The first week of January has got to be the most optimistic week of the year. It’s during those first few days of the new year that most of us commit to goals – resolutions – changes that will make the coming year better than the one that has just passed. We want to be more fit, more healthy, spend more time doing the things that matter most. The New Year has a way of making us reflect on those things that matter most. …And then February has a way of sneaking up on us and reminding us that sticking with goals is difficult. 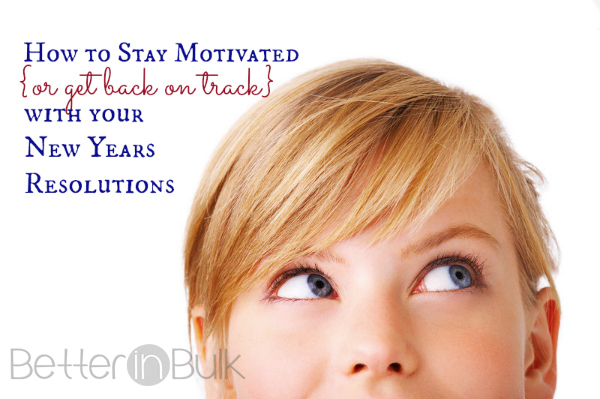 So how do you stay motivated and stay on track with the goals that you made on January 1st (or get back on track if you’ve already stumbled)? Since I am no expert at sticking with my goals, I turned to some of the women I admire most and came away not only with some great tips, but with a fresh resolve to do better…starting today. 2 – Is it realistic? Tonya Stabb is surprised by how well she’s been able to stay on track this year, especially after not doing so well last year. Instead of feeling defeated by a list again, she focused on putting things on a year-long bucket list that will challenge her, but that are doable. Often the problem with staying motivated is that we set too many goals, make them unattainable and feel overwhelmed, or don’t know where to start. 3 – “Half it!” I loved Beth Avant’s advice to half it: If you can’t work out 5 times a week like you resolved to do, work out twice a week and talk a long walk. It’s okay to reevaluate your resolutions and alter them to make them more accessible. 5 – Put it down on paper. Jessica Cohen recommends not only writing your goals down on paper, but also writing your specific reasons for choosing this particular goal and the benefits that will come from succeeding. Say your goal out loud – today and tomorrow and the day after that – to keep it fresh in your mind. 6 – Enlist a buddy. Sometimes all we need is accountability. And an advocate. Whether it’s a friend (online or off), a community of people with similar goals, or simply an app on your cell phone that allows you to track progress, it’s important to have somewhere to report and turn to for support. 7 – Celebrate your successes. Susan Carraretto was right on the money when she said, “I think a key to making these changes in my routine is celebrating my successes along the way. I’m trying to pat myself on the back and encourage myself as I take steps towards changing my lifestyle for the better.” know that I get discouraged when I look at the big picture and see how much I have yet to accomplish. But I always feel uplifted when I accomplish something, however small, that puts me closer to my goals. When I feel like I’m making progress…I actually make more progress. I love how that works! 8 – If you stop, don’t look back. Start again. Danielle Liss was down with the stomach flu for a few weeks in January. Instead of becoming discouraged by her lack of progress, she reevaluated her goals at the end of the month and is ready to move forward. What tricks have you learned to stick with your goals? Build your best year yet! Disclosure: I am blogging on behalf of Visa Prepaid and received compensation for my time from Visa for sharing my views in this post, but the views expressed here are solely mine, not Visa’s. Discover more at VisaPrepaid.com or join the Visa Prepaid community at facebook.com/VisaPrepaid. I’m feeling inspired right now! Such a motivational post. Love it!